What changes make 2020 Honda Pilot different? Efficiency aficionados undoubtedly hope Honda adds a hybrid option to its popular three-row midsize crossover. One is probably coming, and it may well be a plug-in hybrid, at that. But most sources say Pilot won’t go gas-electric until model-year 2022 or ’23. By then, an all-new fourth-generation Pilot could be ready. All this points to minimal changes for 2020, especially in light of a model-year-2019 refresh that addressed a host of shortcomings, most notably by making a full suite of safety features standard on every Pilot trim level. The styling was also updated, the nine-speed automatic transmission revised, and Pilot finally got a hands-free power liftgate. Less critically, Honda restored a volume knob to the audio system. But the first changes to Honda’s largest SUV since this third-generation Pilot debuted for model-year 2016 may not have gone quite far enough. After a robust 25-percent jump in sales for 2018 — fueled in part by inventory-clearance deals on pre-refreshed 2018 models — Pilot demand has cooled. Sales were down 17 percent through the first two months of 2019, in a segment that grew 2 percent. Pilot is likely losing some buyers to increased competition, including from within Honda’s own showroom. The automaker introduced the Passport for model-year ‘19 as essentially a Pilot shortened by 6 inches because it lacks a third-row seat. The less expensive Passport holds appeal for Honda fans who like Pilot’s looks and powertrain, but don’t need seating for up to eight. 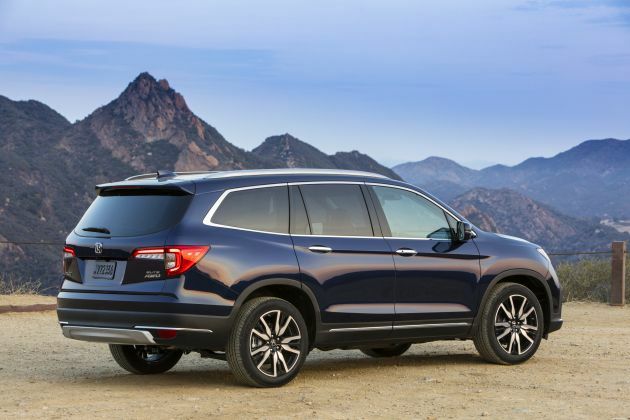 Note that driving impressions and other subjective conclusions in this review are based on road tests of 2019 Honda Pilots. In areas where the ’20 might be different, we reserve judgment. Buy a ’19 if you’re content with Pilot’s fine V-6 powertrain. That’ll get you the styling and features that’ll carry this crossover through to its next full redesign. If you’re in no rush, wait for the 2020 to see if the automaker adds a hybrid model. Honda could lift the conventional hybrid system from the Accord Hybrid or borrow the plug-in setup from its futuristic Clarity sedan. Both team a gas four-cylinder engine with electric-motor assist, but the plug-in Clarity can draw an initial charge from the grid and travel some 47 miles, emissions-free, on electricity alone. In a bigger, heavier Pilot, that could translate to 30-35 electric miles before the system automatically runs as a conventional hybrid. Interestingly, spy photographs show what appears to be a plug-in Pilot undergoing testing. Note as well that Honda’s upscale Acura division offers a 321-horse, V-6/hybrid version of its MDX crossover, which shares much of the Pilot’s underskin engineering. Otherwise, expect the 2020 Pilot to be a virtual repeat of the ’19 – except for perhaps a new paint color or two, and very likely higher prices. It’ll remain a crossover standout for passenger and cargo room, safety and resale value. Sans some sort of hybrid addition, expect the six-model lineup to again start with the base LX trim and ascend through better-equipped EX, EX-L (leather upholstery), and the awkwardly named EX-L w/Navigation and Rear Entertainment System model. It’ll again top out with Touring and flagship Elite trims. All-wheel drive (AWD) should again be standard on the Elite and an extra-cost feature on other Pilots in place of standard front-wheel drive. Will be the styling be different? No, the ’20 will duplicate tweaks so subtle as to persuade most shoppers the 2019 Pilot hadn’t change at all, which may have played a part in the sales decline. Carried over will be a grille modestly revised with Honda’s latest “flying wing” insert, a front fascia reshaped to incorporate trendy lower side coves, and revised taillamps with amber turn signals. Wheels were new but Touring and Elite will again have 20-inch alloys, the other models 18-inch alloys. Pilot’s dimensions were unchanged, so the ’20 will remain among the 14 midsize crossovers with three rows of seats, but one of only six with eight-passenger capacity (the others are the Chevrolet Traverse, Toyota Highlander, Hyundai Palisade, Kia Telluride, and Subaru Ascent). Pilot’s use of space is extremely efficient, with comfy accommodations in the first two rows and genuinely adult-worthy room in the third. The ’20 LX, EX, EX-L, and Touring models will continue a three-passenger second-row bench seat; standard on Elite and optional on Touring will be two second-row captain’s chairs that reduce capacity to seven. The second-row bench is split 70/30, adjusts fore and aft, and on all but the LX has pushbutton releases that make it easy even for small kids to slide sections forward for third-row access. The eight-seaters have latches for up to four child seats. Every ’20 Pilot will again have digital instrumentation, plus orderly and easily identified controls. Expect the LX to retain a 5-inch-diameter central-dashboard infotainment screen and for the others keep their 8-incher and its more elaborate audio system – which for ’19 gained a discrete volume knob in place of a finicky touch-sensitive virtual slider (steering-wheel buttons and by voice commands can also adjust volume). There are numerous bins throughout the cabin, and generous cargo volume is supplemented by a rear underfloor well. A power liftgate should again be standard on EX-L, Touring, and Elite models, with hands-free opening for Touring and Elite. Not unless Honda introduces a hybrid or a plug-in. Otherwise, all ’20 Pilots will again share a 3.5-liter V-6 with 280 horsepower and 262 pound-feet of torque. LX, EX, and EX-L will continue with a six-speed automatic transmission, Touring and Elite with a more efficient nine-speed automatic. Responding to customer complaints about the nine-speed’s rough shifts on 2016-2018 Pilots, Honda recalibrated the transmission for 2019 and our tests of a ’19 Elite revealed a marked reduction in slurred, abrupt, or delayed gear changes. Even with the six-speed, Pilot has enough muscle to drain the drama from merging onto freeways or passing slower traffic. While the six-speed uses a conventional gear lever, though, the nine-speed’s main shifts are via a row of center-console pushbuttons. Used in a range of Hondas and Acuras, the pushbuttons require acclimation and don’t really save much space. The nine-speed also comes with steering-column paddle shifters for a vague semblance of manual gear control. Front-wheel-drive Pilots will again come with a selectable snow mode, but all-wheel drive is better for any-weather control. The system features modes for snow, sand, and mud, but this family crossover, with its class-average 7.3 inches of ground clearance, is not designed for serious off-roading. It is an ideal long-distance cruiser and pretty adept around-town, too. The steering is accurate but over-assisted and you’ll need to respect this crossover’s bulk and tall center of gravity by moderating your speed in sharp turns and on curvy roads. Do that and it’ll respond with composure suited to its mission. On broken pavement, the 20-inch tires are a little noisier and marginally less absorbent than the 18s, but ride quality is good overall, and Pilot is no more suspectable to wallowing or floating motions than rivals its size. It would if a hybrid or plug-in hybrid arrives, but with no mechanical alterations, expect gas-only 2020 Pilots to repeat their 2019 EPA ratings. That’s no bad thing: the ’19 was among the most fuel-efficient three-row crossovers on the road. LX, EX, and EX-L models should again rate 19/27/22 mpg city/highway/combined with front-wheel drive and 18/26/21 with AWD. Look for the front-drive Touring to return at 20/27/23 mpg city/highway/combined and the AWD Touring and Elite at 19/26/22. All ’20 Pilots will again use regular-grade 87-octane fuel. Each will also continue with a mileage-enhancing system that automatically deactivates two or three cylinders in light-throttle driving. Touring and Elite continue with gas-saving technology that automatically shuts the engine off when the Pilot is stopped and restarts it when the driver releases the brake pedal. Don’t count on it after a thorough features update as part of the 2019 refresh. 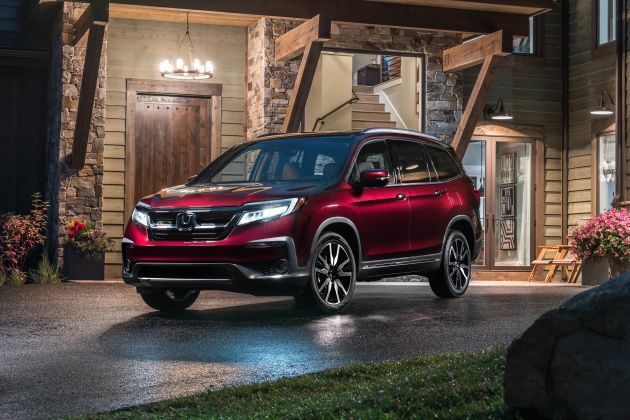 The ’20 Pilot will continue with the refresh’s most important advance: adding the Honda Sensing suite of safety features as standard equipment on every Pilot trim level. It consists of adaptive cruise control to maintain a set distance from traffic ahead; lane-maintaining automatic steering correction; and, vitally, forward-collision warning with autonomous emergency braking that can automatically stop the Pilot to avoid a frontal collision. Previously, Honda Sensing was unavailable on the LX grade and was a $1,000 extra on EX and EX-L. Making it standard – along with helpful blind-spot and rear-cross-traffic alerts – matched the range of safety features standard on direct rivals from Nissan, Toyota, Hyundai, and others. CarPlay, Android Auto, and LED daytime running lights will continue standard across the board. All ’20 Pilots will also come with LED backup lights and LED lowbeam headlamps; Touring and Elite have LED highbeams. Keyless entry with pushbutton ignition, heated mirrors, and a multi-view backup camera will also return as standard. Touring and Elite models will again have 4G LTE WiFi hotspot capability that can support seven devices and stream to their rear entertainment systems, which use a 10.2-inch Blu-ray fold-down ceiling screen. Standard again on the EX-L w/Navi and Rear Entertainment model, the Touring, and the Elite will be Honda’s CabinTalk in-car PA system. Activated via the dashboard touchscreen and using the microphone in the headliner, it projects the voice of the driver or front passenger through the vehicle’s speakers or wireless headphones. 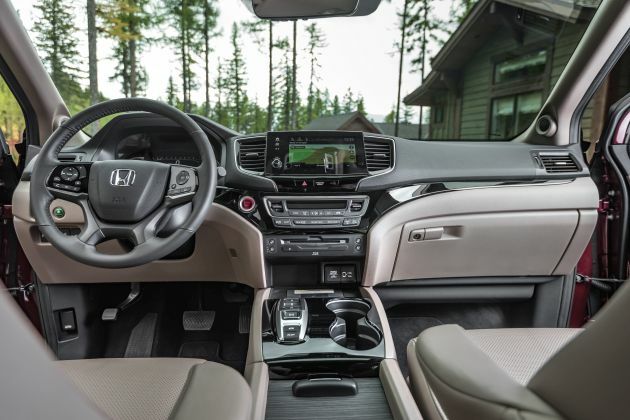 Included again with all but the LX will be Honda’s CabinControl smartphone app that allows Pilot passengers to control various audio, video, navigation, and rear climate functions. Continuing as standard starting with the EX grade will be heated front seats and mirrors with integrated turn signals. Same for remote engine start, a power driver’s seat with power lumbar, and three-zone automatic climate control. Standard beginning with the EX-L will be leather upholstery, a power front passenger seat, a memory driver’s seat, and rear side-window shades. All that, plus imbedded navigation and the rear Blu-ray system will again be included on Touring, Elite, and the model Honda calls EX-L w/Navi and Rear Entertainment System. The Elite will continue to build on that with rain-sensing windshield wipers, heated second-row captain’s chairs, a panoramic sunroof, heated steering wheel, and ventilated front seats. Expect wireless phone charging and power-folding outside mirrors to remain exclusive to the Elite. They’re likely to increase, although modestly so, given Pilot’s sales slowdown and the arrival of younger competitors, such as the redesigned 2020 Ford Explorer and 2020 Highlander, plus the all-new ’20 Hyundai Palisade and Kia Telluride. Note that instead of a menu of stand-alone options or packages, Honda equips each trim level with a specific feature set and prices it as an individual model. Estimated prices here include the manufacturer’s destination fee, which was $1,045 on the ’19 Pilot. Most buyers will continue to choose AWD, which will again add $1900 to the price of all models except the Elite, where AWD is standard. With AWD, estimated 2020 Pilot prices are $34,850 for the LX and $37,725 for the EX. Expect the AWD EX-L to be priced around $41,100 and the AWD EX-L w/Navi and Rear Entertainment System around $43,200. Estimated price for the ’20 Pilot Touring with AWD is $45,950 with seating for eight and at $46,250 with the second-row captain’s chairs. The 2020 Pilot Elite should be priced around $49,600. Release date for the 2020 Honda Pilot should be in the third quarter of 2019.